What Is the Land & Water Conservation Fund? In today’s political world, rare is the program over 75% of Americans can agree on. To have that support, it must be a Red White and Blue idea. Well, one such idea exists. It’s existed since 1965; the Land and Water Conservation Fund (LWCF). Fifty years ago, back when people actually solved problems, the oil and gas industry, along with hunters and anglers, agreed on a program to mitigate the known impacts of offshore oil and gas exploration. It was decided, and supported by all, that some of the offshore royalties would be earmarked to this new account, the Land and Water Conservation Fund. The purpose – Use those funds to restore habitat and enhance public access. Imagine that. A good idea supported by all sides, even Congress. There was a time in this country when good ideas were not the enemy of politics. Roll forward fifty years. The LWCF has invested $13 billion dollars into public access for hunters and anglers, in the process, helping all outdoor recreation. Millions of acres of public access has been acquired or improved. Thousands of boat ramps, fishing piers, and fishing access sites have been funded. Yeah, Congress has managed to pilfer $17 billion dollars from the fund for other uses, but I guess we’ve come to expect that. Congress can make amends for past sins by reauthorizing this popular program in 2015. Hopefully placing the funds in a trust account, reducing the temptation of diversion. A 2013 survey of Americans showed that LWCF enjoys a popularity quite the opposite of Congress. Over 85% of those asked want to see LWCF continue; marking 93% approval among Democrats and 78% among Republicans. The support in 2013 has grown from 81% support in the 2009 survey. Congress could do something that almost all Americans support; reauthorize LWCF. I suspect the oil and gas industry prefers that a small fraction of their royalty payments stay earmarked for something beneficial, such as LWCF, versus tossed to the dark abyss of Congress. Hunters are the greatest beneficiary of LWCF. Especially seeing the NSSF survey shows that losing “places to hunt” is the top reason people are hunting less. LWCF has provided more places to hunt than any program, ever. LWCF is the quiet program that provides matching funds to states, conservation groups, and local agencies to fund hunting and fishing access. In my back yard of Bozeman Montana, the Gallatin National Forest has had over 200,000 acres of access acquired or improved by LWCF. All who hunt and fish can probably find a similar LWCF story in their back yard. Maybe your favorite spot. In the coming year, Congress will face reauthorization for LWCF. Hunter, anglers, and the groups who represent us need to pressure Congress to reauthorize our most important access program, LWCF. In 1965, our legacy of hunting and fishing was handed a gift in the form of LWCF. Now is the time to make sure we can do the same for those who come after us. 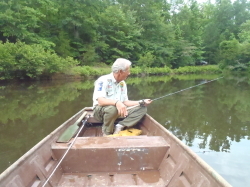 This entry was posted in Fishing Politics on July 10, 2014 by ronniegarrison.